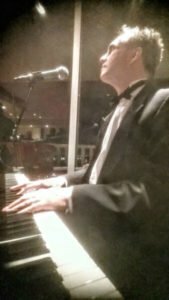 Pianist for Parties Los Angles. Marc Bosserman will make it memorable. Yes, as long as I’m playing all over town and play about 40 gigs a month you might as well say that I’m qualified to say Pianist for parties Los Angeles in this blog post! Yes, I should keep better track of this, But, I’m going to hazard that I played 100 plus parties this past year and just last December which is the party month of the year…I’m going to say….20 for that one month. For many years and in the Los Angeles area I have played for 1000s of parties and have many people who hire me to play multiple times a year and/or yearly. The only way to be a howling success as a Pianist for Parties Los Angeles is to play a lot. And I have no problem with that. And, I also stay in touch with people that I have played for via my weekly emails and let them know what my schedule is. Additionally, I play all over town and regularly play gigs in some of the coolest venues in the area. Including, The Parkway Grill in Pasadena, Red Restaurant, and Bar at the Pacific Palms Resort, where I play every Tuesday night from 6:30 to 9:30. And Larsen’s Restaurant in Valencia-Sunday nights 5:30-9pm. Come to a gig and hang out with me some night. And also please keep in mind that if you have an event on one of my regular nights and want to book me I am able to find other amazing players who can sub for me at those venues. And so, I can probably play for you. My job TOTALLY ROCKS! I often am amazed that I’m able to get paid to do this thing that I love to do. It’s one of those pinch me, I must be dreaming scenarios. Meeting new people and playing amazing music for them drives me.